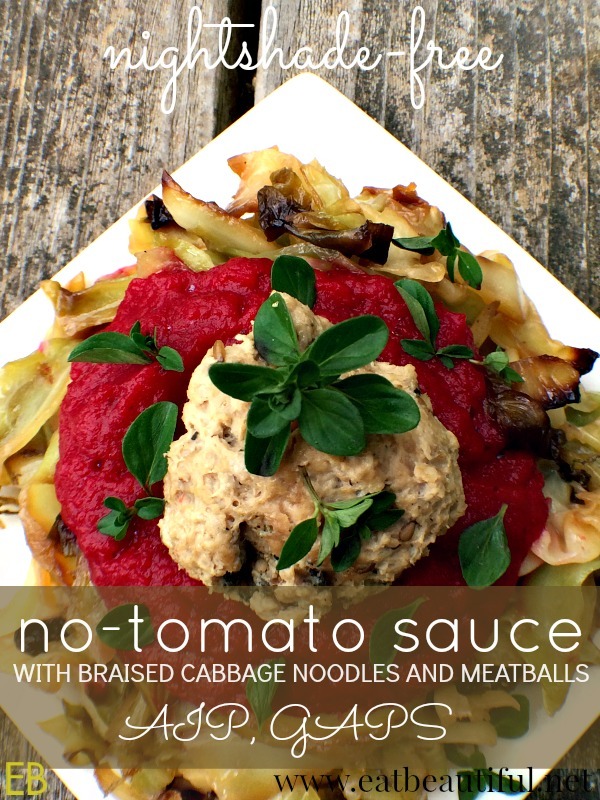 No-Tomato Sauce, served with Braised Cabbage Noodles & Turkey Meatballs~ nightshade-free Nomato Sauce! This is one of those casual meals that makes everyone full and happy. The no-tomato (aka nomato) sauce is something I decided to try recently, while taking a break from nightshades. Nightshades, as you may already know, are a category of produce than can exacerbate inflammation. 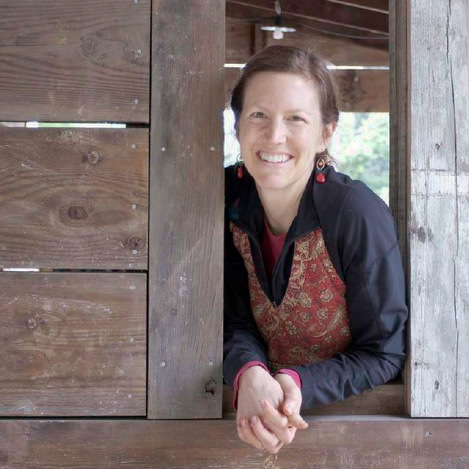 So often times, those of us with autoimmune conditions, especially those following the Autoimmune Protocol (AIP diet), will forgo this whole group of vegetables and fruits to find added relief from inflammatory symptoms. A comprehensive list and more details about nightshades can be found here. The most common include the following: peppers, eggplant, tomatoes, tomatillos, goji berries, potatoes, paprika, all spicy and smoky peppers, including dried spices such as chipotle, curry and cayenne. We all loved this sauce and were amazed, really, how similar to tomato sauce it is! I didn’t set out to make it taste JUST like tomato sauce, but more to create a yummy red sauce. But the lime juice and other flavors really marry so beautifully and you do get a very tomato-y, delicious flavor and texture. If you’re not avoiding nightshades, I still recommend this sauce. Served over cabbage, with meatballs, it’s one yummy meal! If you’ve got summer produce to process- beets, carrots and turnips- this is a great way to use them! And this sauce freezes beautifully. So you can even make a big batch for convenient, healthful, future meals. I’ve mentioned before that I always have bone broth simmering in a crock pot. I use this simmering savory goodness to make my life easier. On the days or nights when I have little time to cook, I use the broth to cook my veggies or meat. This is like the Chinese hot pot. Nothing could be simpler and it makes meat moist, veggies EASY, and the broth, well, it makes the broth taste like whatever you’ve cooked in it, which is fine. Regarding braised cabbage, have you had it? It is one of life’s pleasures. Economical yet gourmet, the pan juices and wilted goodness of the cabbage are comfort food with an elegant finish. De-glazing the pan with scant vinegar, starting with bacon fat and sea salt, you get a silky bit of caramelized goodness. Enjoy this meal. If you do use your crock pot, you will use very little energy and heat to cook this meal, an added bonus, especially during the summer months. You'll have meatballs and sauce leftover, which for us is always a good thing. Double the cabbage recipe, if you prefer, using two pans for the added quantity. Vegetables can be steamed, or boiled in bone broth. I always have a crock pot of bone broth going; so for me, it's easy to pop veggies into the simmering broth and have them cook without any effort on my part. Either way, cook veggies until they're very tender: carrots, turnip and beets. Place the 2/3 cup bone broth in blender. Add slightly cooled, cooked veggies. Add remaining ingredients as well: lime juice, ginger, turmeric, garlic, oregano and sea salt. Puree until smooth, 30-50 seconds. You will have a thick, beautiful sauce. Sprinkle salt, pepper and thyme over turkey. Mix it into the meat; but don't over-mix. Form meatballs, whatever size you like. I prefer large meatballs because they remain moist inside and they're faster to produce. My kids like making little ones. Heat fat in a large saute pan. Add onion and cook over medium heat for 5 minutes. Add cabbage and sea salt. Saute over medium-high heat for 5 minutes; then turn heat to low and cover for 35 minutes, opening and stirring every 10 minutes or so to prevent burning. Add the broth and vinegar to deglaze the pan, scraping up any bits that are stuck and folding the noodles to distribute the pan sauces. Serve. Top with No-Tomato Sauce and Meatballs. This sounds delicious! So nice to have a recipe that is tomato free, but still full of flavor and just like the regular sauce. No one needs to miss out! Braised cabbage is a staple in my kitchen. I love it by itself and will be trying it with a sauce and added meat this week. Thanks for the ideas! So glad!!! Hope you love it, as we do! Yes, braised cabbage! This is amazing!!! 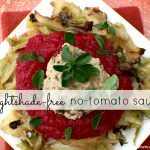 We were nightshade free for several years and it’s tough! This is beautiful and just screams comfort food! What a great alternative! You are so creative! Me too. The ginger and lemon juice wooed me into loving this! And yes, the extra veggies, sooo healthy. All that good veggie fiber and their nutrients with a good bit of high-fat, sustainably sourced protein! Thanks, Tash! 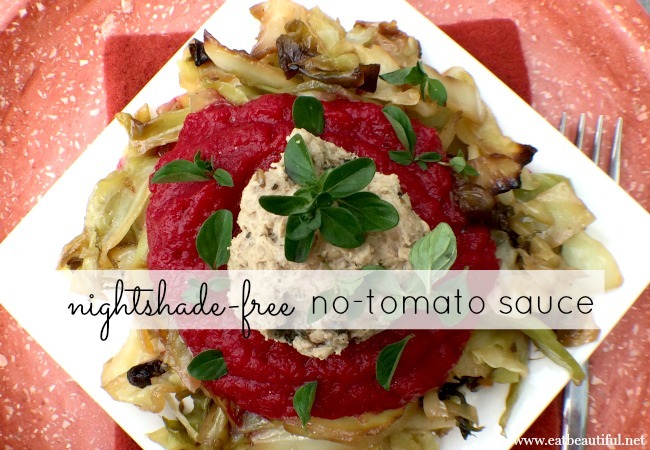 This looks delicious and is so awesome for those with sensitivities to nightshades. Thank you for sharing Megan! I seriously am addicted to braised cabbage 🙂 Love it! That sauce looks fantastic – I can’t believe there are no tomatoes in there! This is great, I love the no nightshade idea because so many people have issues with them. Yum! Thanks, Jessica! I agree; it’s so nice to have new options. I adore braised cabbage. Love this recipe.